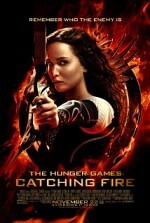 Watch The Hunger Games: Catching Fire: Twelve months after winning the 74th Hunger Games, Katniss Everdeen and her partner Peeta Mellark must go on what is known as the Victor's Tour, wherein they visit all the districts, but before leaving, Katniss is visited by President Snow who fears that Katniss defied him a year ago during the games when she chose to die with Peeta. With both Katniss and Peeta declared the winners, it is fueling a possible uprising. He tells Katniss that while on tour she better try to make sure that she puts out the flames or else everyone she cares about will be in danger. Mocking Jay needs to come out soooooooooon ! thanks for the free movies :), i really love this Movies in part 1 until now. Awesome movie! But I really wish the links actually worked so that I could watch it. Really great movie. Makes me want to rewatch the first one. powerful! great movie! 5/5 rating! Is anyone else's audio off sync from the actual movie? This movie and the move "Escape Plan" both had these issues, I'm starting to wonder if this is just my computer, although other movies work. I'm new to this I'll try to look for replies. But other wise warning people the movie goes off sync about 7-9 minutes in to the movie and continues through out the rest. Good one to watch! Waitin' for the next one. i so love this movie!! Awesome movie! I wish the quality was a bit better, but I love it anyways! Just saw this movie at the theatre. Really great! As good as the first one. I want to see the next one. 4.5/5 Excellent Sqeual. I cant wait for The next 1. Saw this movie in the cinemas last night, so so good! Can we please have links though?